After this week's MWC 2017 showcase, it seems LG won't be hanging around when it comes to getting its LG G6 smartphone on store shelves. 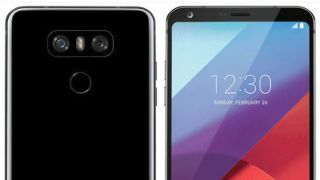 According to a "high-ranking official for a mobile network provider" speaking to ETnews, the Korean firm is looking at March 10 for the LG G6 release date. The same source also claims to have insider knowledge of the Samsung Galaxy S8 release date, putting the rival Android flagship phone on an April 21 release date. That'd give LG a 42 day headstart for its smartphone hope against its greatest opposition. While we're still waiting for an exact date that the Samsung Galaxy S8 will be revealed, we do know that the LG G6 will be shown off in all its glory on February 26. We'll be going hands-on with the phone as soon as it's revealed...but we already know almost everything there is to know about the phone. One of the most-leaked devices in recent memory, we're expecting a waterproof metal bodied handset, with slim bezels and an unusual 18:9 screen aspect ratio. We'll be covering all the MWC 2017 action in Barcelona live from this Sunday (February 26), so stay locked on TechRadar to see how the LG G6 fares.